The second annual High Sierra Parent Conference, held Oct. 7 at Feather River College, was created by several community members dedicated to bringing parents together for a day of collaboration, learning and fun. With an emphasis on honoring the strengths of parents and their commitment to parenting day in and day out, our guiding principle is that strong parents make for happier, healthier families.This year’s presenters were Justin Margolis and Kay Paden. Margolis is from Valley Oak Children’s Services where he coordinates the Butte Parent Café and InsideOut Dad program. In addition, he serves as the Fatherhood Program coordinator and organizer of Parent Voices, Butte County Chapter. Margolis facilitated the Parent Café at this year’s conference, which is based on the Strengthening Families Framework and highlights five protective factors: social and emotional competence of children, knowledge of parenting and child development, social connections, parental resilience and concrete support in times of need. Kay Paden, owner of Heart Wired Consulting, works as a program specialist for Butte County where she teaches classes and coaches on the Nurtured Heart Approach, Trauma Informed Practices, Crisis Prevention Intervention and universal design for learning and special education services. The Nurtured Heart Approach is a relationship-focused methodology founded strategically in “The 3 Stands” for helping children (and adults) build their “Inner Wealth” and use their intensity in successful ways. It has become a powerful way of awakening the inherent greatness in all children while facilitating parenting and classroom success. The conference included a complimentary breakfast, lunch and child care for the duration of the day. At the Child Development Center on the FRC campus, a group of very dedicated teachers led by Kinderlin Hoznour spent the day doing the work of children: playing. In addition, we were honored to have Nancy Frady provide a creative art experience and Ann Frid doing interactive storytelling and movement. Michelle Beaman brought the afternoon to a calm end with children’s yoga. 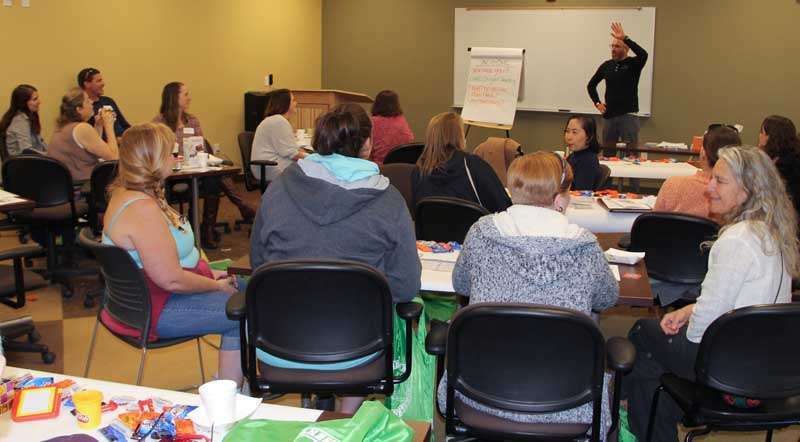 Many Plumas County community service members made the High Sierra Parent Conference possible. Sponsors who generously donated resources and support to make this event possible are Feather River College, First 5 Plumas, Plumas Early Education and Child Care Council, Plumas Rural Services and Plumas Children’s Council. The families of Plumas County thank you!